Only the gauche form is stable. The anti form is in fact a transition state for enantiomerisation of the two chiral C2-disymmetric gauche forms. The difference in free energy between the gauche form and the anti is 25.3 kcal/mol, compared with which the 0.5 kcal/mol for 1,2-difluoroethane looks puny indeed. The effect arises, as with difluoroethane, from overlap of the filled p-lone pair on one sulfur, with the accepting S-F σ* orbital. 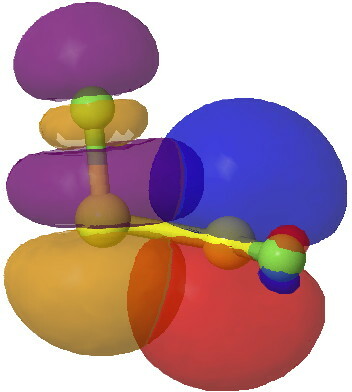 This orbital overlap results in an NBO E(2) interaction energy of 39 kcal/mol. This compares with 5.6 kcal/mol for the equivalent C-H/C-F* term for difluoroethane, and it is of course larger because an S lone pair is a far better donor than a C-H bond. It is also far greater than the anomeric effect, which normally weighs in at about 16 kcal/mol. There is of course an alternative (and perhaps more unusual) transition state for interconverting the two enantiomers of F-S-S-F which I described previously for F-S-S-Cl as involving a [1,2] migration of F. It however is 23.5 kcal/mol higher in energy than this pure bond rotation. Whereas the [1,2] F migration contracts the S-S bond at the transition state, the bond rotation lengthens it (from 1.922 to 2.142Å). This arises because the partial double bond character for the S-S bond is destroyed by rotation. The challenge then is whether one can find a 4-atom system where enantiomerisation proceeds by a lower energy continuously-chiral [1,2] migratory pathway rather than just by a simple bond rotation. The two basins ringed in blue (2.25e) are each aligned at an angle of 167° to the axis of the antiperiplanar S-F bond. 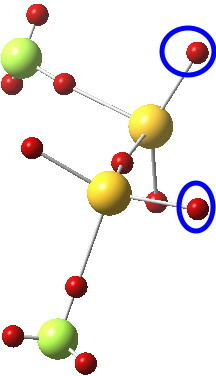 The knock-on effect of this is that the two lone pairs on each sulfur themselves subtend an unusual angle of 145° at the common sulfur, almost diaxial in fact. I again marvel at how just four atoms and just two elements, can teach us so much chemistry! This entry was posted on Saturday, September 21st, 2013 at 8:55 am and is filed under Interesting chemistry, reaction mechanism. You can follow any responses to this entry through the RSS 2.0 feed. You can leave a response, or trackback from your own site. I have computed the Wiberg bond order indices for F-S-S-F. The S-S bond order is 1.47, and the S-F 0.70. This matches the relatively high barrier for S-S rotations. I mentioned that F-S-S-F has disymmetric chirality. For the (M) enantiomer, one can compute the following chiroptical properties: the specific rotation is +247°589, +820°365. Note the vibrational circular dichroism has a very strong Δε, the symmetric and antisymmetric F-S stretches being respectively negative and positive. An example of an extreme gauche effect: FSSF. is licensed by Henry Rzepa under a Creative Commons Attribution-Noncommercial-Share Alike 3.0 United States License.